Named after ‘man’s best friend,’ Cosmo’s will soon be your best friend. This lovely spot tucked off Canal Road is cool and colorful, with a beautiful courtyard in the middle of it. It’s a happy setting, a place where you can linger with friends over good food and lively conversation. There are plants everywhere in this open and airy oasis. Live music nightly on the deck is just the cherry on top of their Soul Lovin’ Puddin’ – one of the restaurant’s most popular desserts, a bread pudding that changes flavor daily. The best way to describe the cuisine – and the atmosphere, come to think of it – is Southern Coastal, which is slightly upscale but entirely unpretentious. We love the Sesame Seared Tuna (ordered rare, of course, because it’s so fresh there’s no other way to eat it) and the bacon-wrapped Chicken Roulade. Popular sushi rolls include the Duck Roll (yes, quack) with cream cheese and pepper jelly, and the Fried Green BLT Roll, with fried green tomatoes, bacon, lettuce and creole mayonnaise. Enticing sides like gingered greens, “dirty” risotto, and roasted garlic and smoked bacon grits round out the eclectic dining experience. As you can tell, everything here is done with a twist. Believe us, Cosmo’s makes ‘twisted’ look (and taste) good. If you can only visit once, might we heartily recommend a dish you’ll go bananas for … the Banana Leaf Wrapped Fish, heralded by The Year of Alabama Food as one of the ‘Top 100 Dishes to Eat Before You Die.’ It’s … ‘to die’ for. Daily Happy Hour from 3:30 to 5:30 p.m. features $5 sushi rolls and other small-bite specials. 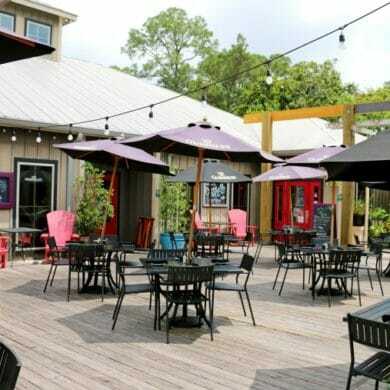 While you wait for your table, check out Maggie’s Bottle and ‘Tail across the courtyard – it’s a cute boutique selling local art, jewelry, souvenirs and (as the name implies) packaged beer and wine to take back to your private Gulf front balcony. As of Spring 2016, Cosmo’s Restaurant is now part of Cosmo’s Courtyard, where you’ll find new ventures by owners Brian and Jodi Harsany, like Luna’s Eat & Drink for craft beer lovers, and BuzzCatz coffee shop – depending on the kind of buzz you’re after. Cosmo’s is located at 25753 Canal Road in Orange Beach AL. For more information, please visit the restaurant website or call (251) 948-9663.